Ok, Outlander fans, I figure by now you may finally be able to tear your eyes away from that amazing Jamie Fraser photo that Starz gifted us for Valentine's Day long enough to feast your eyes on some other new content for the series. Assuming that's the case, now seems as good a time as any for a new photo round-up, and we'll start with the one above, which Starz shared on their Outlander Facebook page in an effort to extend a "verra Scottish Welcome" to all the new fans of the page. 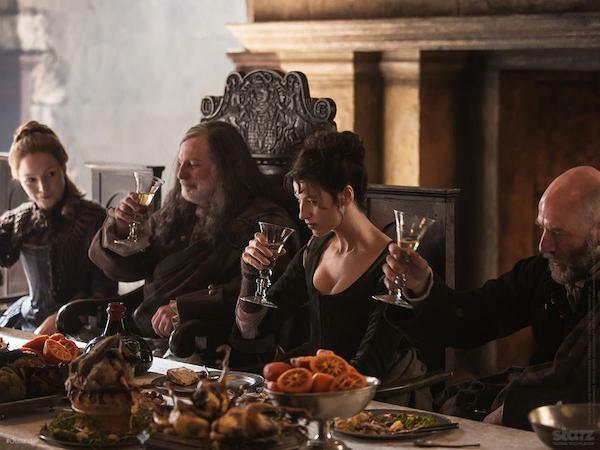 We get a glimpse of Claire looking beautiful, seated at the dinner table between Colum (Gary Lewis) and Dougal MacKenzie (Graham McTavish). It looks like an alternate glimpse of the photo we saw last month, except this one puts another woman in the frame, and I'm going to guess that's Colum's wife Letitia. For those who haven't read the book, the story is set mostly in 18th Century Scotland. It follows Claire Randall (Caitriona Balfe), a World War II combat nurse who's on vacation with her husband when she finds herself thrown back through time. Faced with trying to survive centuries before her time, she's eventually forced to marry Jamie Fraser (Sam Heughan), a gallant young warrior and outlaw. Ron Moore is adapting the series, which is currently filming in Scotland, and Starz has been pretty great about giving fans glimpses of the series while we wait for a premiere date -- it's expected to arrive this Summer. Follow him on Twitter to keep up with his posts of the day. Like the last Speak Outlander video, this one uses footage taken from the Outlander fan event, as we see fans trying to pronounce the characters names. I expect we'll all be experts at Gaelic name pronunciation by the end of the first season. It's worth noting that one fan mentions that we don't like Laoghaire. In the first book, she's introduced as a young maiden with an interest in Jamie Fraser. So it's not hard to understand why people aren't fans of her.